On November 20, 1974, the fist B-747 goes down. 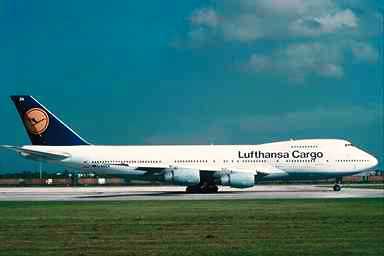 The Lufthansa, flight 540, stalled on takeoff resulting in it crashing killing 59 of the 157 passengers onboard. The crash happened near Nairobi, Kenya. It was reported that the cause was due to a failure to have extended the wing flaps. Lufthansa Flight 540, registered as D-ABYB, was a commercial Lufthansa Boeing 747-130, carrying 157 people (140 passengers and 17 crew members), operating the final segment of its Frankfurt–Nairobi–Johannesburg route. On November 20, 1974 it crashed and caught fire shortly past the runway on takeoff. This was the first ever crash involving a Boeing 747. As the plane was making its takeoff from runway 24 at the Jomo Kenyatta International Airport in Nairobi, the pilots felt a buffeting vibration. The captain continued the ascent and retracted the landing gear. However, as this was being done, the plane started to descend and the stall warning system light came on. The plane continued to descend and approximately 3,700 feet (1,100 m) from the end of the runway, the plane grazed bushes and grass. It then struck an elevated access road and broke up. The left wing exploded and fire spread to the fuselage. Of the 157 people aboard, 59 perished (55 passengers and 4 crew members). Heroic efforts by crew members saved a number of lives. Thomas C. Scott, a commercial pilot working the flight as a cabin crew member, was credited with saving the lives of a dozen passengers before the fuselage exploded by carrying the injured and escorting the dazed. Survivors included German-born American Jews who were returning from a Holocaust pilgrimage. The cause of the crash was determined to be a stall caused by the leading edge slats having been left in retracted position. Without slats deployed, the aircraft's stalling angle of attack was much lower, especially at a hot and high airport like Nairobi's with its airport elevation of 5,327 feet (1,624 m). The thinner air at higher altitudes generates less lift and further degrades the airplane's ability to handle high angles of attack, as well as reducing the thrust provided by the 747's four turbofan engines. The elevation and temperature at the airport were within the capability of the 747, but only with slats extended. With slats retracted, the aircraft lacked sufficient lift and thrust to continue climbing once out of the ground effect found near the surface. The flight engineer was found to have failed to open the bleed air valves as required on the pre-flight checklist, preventing engine bleed air from flowing to the 747's pneumatic system and keeping it from working. This prevented the slats from deploying during takeoff. The flight crew was blamed for not performing a satisfactory pre-take-off checklist, but the accident report also faulted the lack of adequate warning systems which could have alerted the crew to the problem. Two previous occurrences of this error had been reported, but in those cases the pilots had been able to recover the aircraft in time. After this third, deadly incident Boeing added systems to warn pilots if such conditions existed prior to takeoff.